While early voting (15 days prior to the election) is the law in Arkansas, county election commissions have discretion at to the locations and times when early voting is held. In all cases one has the option to present themselves at the county courthouse starting October 20, 2014 and cast their ballot in the November 4th general election. By state law county election commissions can allow additional early voting sites be setup around the county with a unanimous vote of the commission members. Other restrictions concerning early voting include the provision that machines used may not be used in the general election unless and until the voting record (the paper tape and memory) are replaced and zeroed. The county has 106 voting machines of which 4 are non-working, with no funds available to get them repaired. The remaining 102 machines have not been inspected, but 92 machines have been selected to be used in the general election. With no funds available to repair broken election machines the main concern with early voting is the general wear and tear and transportation to the early voting sites, combined with the age of the machines (most machines are more then 10 years old) means that these machines are going to be more prone to failure. Four sites around Lonoke county were selected for early voting. The sites were the towns of Cabot, in the northern part of the county, England in the south, and Carlisle and Lonoke. At a commission meeting in early August it was decided that the sites in England and Carlisle would have early voting from October 20 through the 25th with the intervening week before the general election not being a period where early voting could be done at these two locations. At the commission meeting held Aug 29th election commissioner Chuck Eick, the lone republican on the three member commission, suggested a compromise to only allow early voting in Carlisle and England on Friday Oct 31, and Saturday Nov 1st. This is going to leave most of the residents of the southern half of the county the only option being to drive up to 40 or 50 miles in order to vote early in an election that has many expecting a large turnout for a cycle that has all Statewide positions and one of the nations most hotly contested Senate seats hanging in the balance. The towns of Cabot and Lonoke will have early voting for the entirety of the 15 days preceding the Nov 4th general election as allowed by state law. Confusing, isn't it? Which brings me to the wider area of concern, our election system itself. And, by that I mean that way we vote. 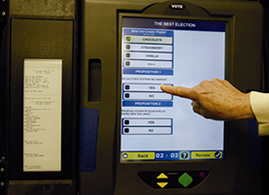 Election Systems and Software was chosen as the vendor for new voting machine equipment across Arkansas when the Help America Vote Act became law in 2002. The requirement in this law to make voting more accessable to those with disabilities was used, in my opinion, to discard the previous method most used in the state, the Optical Scan Ballot, in favor of the Touch Screen voting system. In 2003 grant money was made available from the Federal Government in order for States to purchase new voting equipment. What we got were machines like the above, the Ivotronic from ES&S. These machines are slow, and prone to failure, see examples here, here and here. And the worse part about it is that THERE IS NO OFFICIAL PAPER RECORD Every ES&S machine that I have voted on has had a paper tape that shows you what was recorded as your ballot response, but should there be any question as to the number of votes cast in a particular race or ballot initiative, it is not lawful to use these paper records as the record of the vote, one may merely query the machine again for another tally of the votes. Prior to 2003 many if not most counties in the state used the Optical Scan Ballot wherein you would use a No.2 pencil to fill in the oval bubble next to your choice and the ballot was read by an optical scan device. Now, I know, these devices also have had a history of known failures and issues, but the actual ballot that you marked up was THE OFFICIAL PAPER OF RECORD that could be hand counted at any time, and used as a means of auditing the accuracy of the machine tallied vote. We have an opportunity coming up in the state, to get away from the touch screen voting machines that leave no paper trail, and at least returning to a system where we have an actual paper ballot that can be hand counted and audited for accuracy. When the state purchased the ES&S machines it was with the understanding that they would have a life expectancy of 10 years. We are beyond that 10 year point in most cases. There is not nearly enough money in the election fund to purchase new touch screen voting machines for every voting precinct in the state, and no Federal grant money in the offering either. We do, however, have the funds to purchase new optical scan devices and retrieve those that are gathering dust in courthouse storage rooms and return a little bit of the piece of mind that we once enjoyed, knowing that your vote was somewhere, in a box, and not as a magnetic bit on a flash storage device, if anywhere at all. Thus we are back to the story of Lonoke county having to curtail early voting, for fear of damaging the few working machines that they have for the nearly 50,000 eligible voters in the county. We are coming up on a chance to decide are we going to be able to make it even easier for someone to vote, and vote earlier at their convenience, or are we going to waste this opportunity and see fewer and fewer chances and places to vote, with the corresponding longer lines and wait times for the few remaining workable and untrustworthy voting machines.